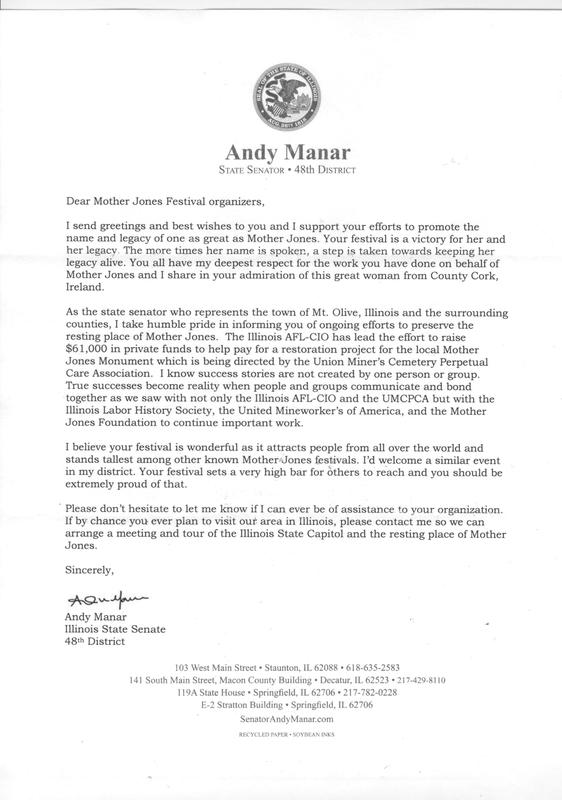 The Cork Mother Jones Festival Committee has received a warm message of support and encouragement from Illinois Senator Andy Manar. The Cork Mother Jones Committee acknowledges and supports the huge effort being made by the Unions, the Illinois Labour History Society and the Mother Jones Foundation to preserve and restore the monument over the grave of Mother Jones in Mount Olive cemetery. The restoration project will ensure that this monument over her final resting place will remain for ever as a fitting symbol of positive action for social justice which the spirit of Mother Jones inspires in thousands of people across the world.